The government has reduced the maximum amount lenders can charge for a payday loan. People walking in front of a Money Mart store in Toronto. 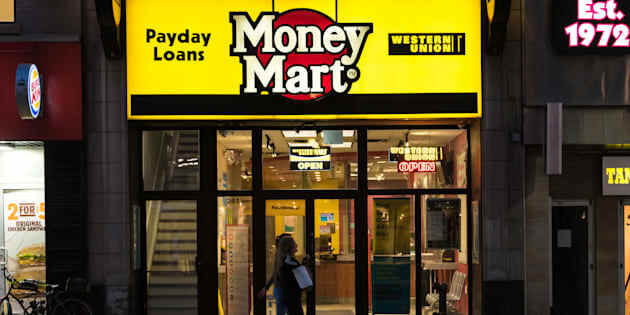 TORONTO — A study by a Toronto-based firm says the rate of insolvent borrowers using payday loans in Ontario has grown for the sixth consecutive year. Insolvency trustee firm Hoyes Michalos & Associates says 31 per cent of insolvent borrowers used the loans in 2017, up from 27 per cent the year before. The study suggests payday loans are a growing factor in personal insolvencies in Ontario, with struggling debtors are taking out fewer but larger loans despite recent changes to lower borrowing rates. As of Jan. 1, 2017, the provincial government reduced the maximum amount lenders can charge for a payday loan to $18 for every $100 borrowed, down from $21 for each $100. Earlier this year, the rate was further reduced to $15. Hoyes Michalos & Associates says they looked at 3,500 insolvency cases and found the average number of payday loans outstanding at the time of insolvency declined to 3.2 in 2017, but the average payday loan size was $1,095, an increase of 12.4 per cent from the year before. In total, insolvent borrowers owed an average of $3,464 from all their payday loans, the study says, or $1.34 for every dollar of their monthly take-home pay. "Insolvent borrowers are now 2.6 times more likely to have at least one payday loan outstanding when they file a bankruptcy or consumer proposal than in 2011," said Ted Michalos, co-founder of Hoyes Michalos & Associates. "This is a cycle that is just not sustainable." Although the average monthly income for a payday loan borrower is $2,589, the study also found that payday loans are more likely to be used by debtors with a monthly income of more than $4,000 than they are to be used by those with an income between $1,001 and $2,000.